These spiralized veggie Thai noodle bowls are tossed in a creamy peanut sauce and loaded up with tons of veggies! Oodles of zoodles coming your way, along with crunchy cabbage and creamy dreamy peanut sauce. Apparently some people think zucchini noodles are the food trend that needs to die off in 2017, but I personally just can’t get enough of them! Maybe this is because I don’t ever consider zoodles to be a pasta replacement. I know my body would know the difference between a zucchini noodle and real pasta in about 2.5 seconds. I like to supplement my zoodles with some pasta, and in these spiralized veggie Thai noodle bowls recipe I used whole wheat spaghetti. 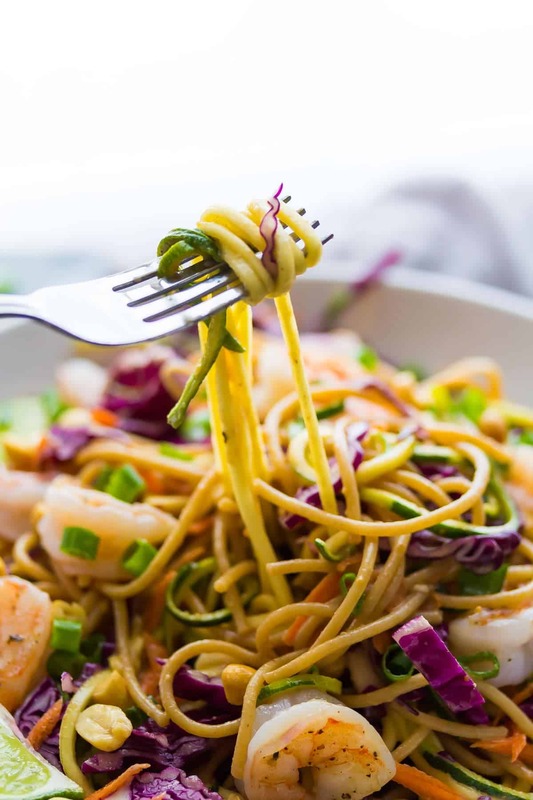 So we’re getting a ton of veggies, some real deal pasta, a creamy peanut sauce and some shrimp…a totally well balanced healthy meal that is on your plate in 30 minutes! Ever since December 26, my body has been craving veggies in a huge way! We’ve been eating a ton of stir fries, big salads, and the spiralizer has been out to play, too. So. 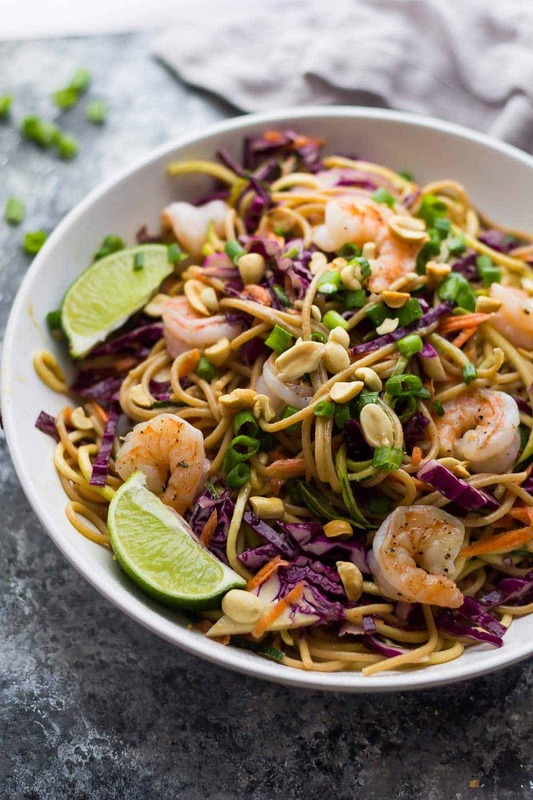 These spiralized veggie Thai noodle bowls kind of have an identity crisis…you can eat them hot, as a ‘stir fry’ kind of meal, or you can enjoy them cold, as more of a ‘salad’. Is it weird that I actually prefer them cold? The peanut sauce is the same one I used in my Shrimp Peanut Soba Noodles recipe in my 30 Minute Dinners eBook…it is so simple: peanut butter, soy sauce, sesame oil, lime juice and brown sugar. Ready in 5 minutes, and you can even make it ahead and freeze it! Actually, you can also prep the veggies ahead, too, and store them in the fridge for 3-4 days. 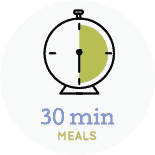 Then when it comes to dinner, you have saved yourself 10 minutes of prep time. Woo hoo! 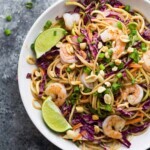 I used shrimp in this recipe because shrimp + peanut sauce is heaven in my book, but by all means, add your favorite protein! Tofu would probably be great, or chicken. Alright friends! 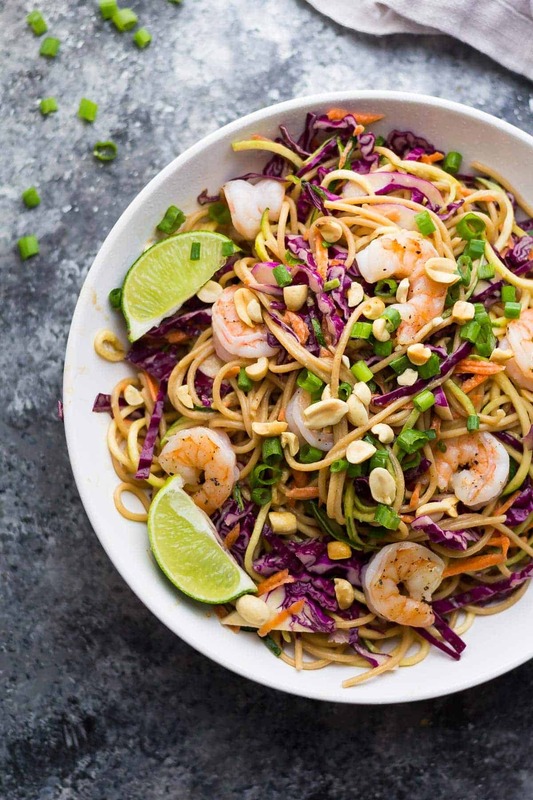 It’s 30 Minute Thursday, meaning that in addition to these spiralized veggie Thai noodle bowls, there are a whole lotta delicious 30 minute meals coming your way. Check them out! Shake together all peanut sauce ingredients and set aside (it helps to heat the peanut butter in ten second increments in the microwave first). While pasta is cooking, cook the shrimp: heat olive oil in a non-stick pan over medium heat. Add the shrimp and season with salt & pepper. Cook 3-5 minutes, turning halfway, until pink and cooked through. When pasta is cooked through, drain thoroughly. Combine with the vegetables and toss in the peanut sauce. Top with cooked shrimp, green onions and crushed peanuts. Wow, what an amazing compliment! So happy you liked it Tina! Hi! I guess I’m the odd person out as I don’t like zucchini and don’t own a spiralizer. What I do want to know is can this be made without the zucchini and still be as good and healthy? This may be the first bowl that I make as I have been looking for something to take to work since I work 2nd shift and don’t want anything heavy but is filling and good for me. Glad that I lucked upon this recipe. Hey Donna! Absolutely, feel free to leave out the zucchini. You can add extra veggies to replace it, maybe some bell peppers would be nice! Oh my goooooosh, now these are noodle bowls I can get behind! I love that it’s both a mix of real noodles AND zucchini noodles so you get the best of both worlds! Haha, who thinks that?! I’ll beat them up! 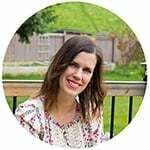 I don’t use my spiralizer nearly as much as I should but I’m going to try to bust it out more this year! I agree, I like supplementing my regular noodles with some added zoodles rather than just eating a bowl of zoodles. I love the Thai flavors you have going on here! 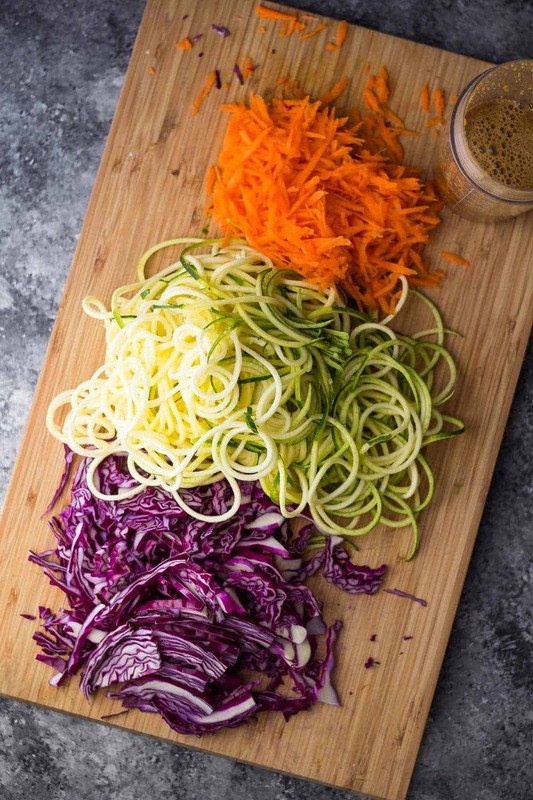 One important question…which spiralizer did you use? How do you get such nice, thin zoddles. Going to make this. Have been spriralizing for about 6 months. I’m allergic to both sea food ? And soy. So chicken and coconut aminos . So don’t miss out on great food. Love your site. Who cares what people say….zucchini noodles are the best! I should try combining them with real pasta too, then the kids will be more apt to eat them…that’s a good idea! This is one gorgeous dish, Denise, and I totally agree — shrimp and peanut sauce is heaven! I need to get on this spiralizer trend before it dies out. I love how thin the veggie noodles are and I think I’d definitely have to mix them in with some real deal pasta too! So perfect for getting more veggies in your diet! Oh my, I’m with you Denise! Bring on the veggies! I had way too many cookies and am now paying for my indulgences.. even my stretchy pants are snug :/ … but this thai bowl inspires me to get back at it! That sauce?! OMG! Love that it can be frozen and on the ready when needed. I’m loving all the colors and veggies my dear! Happy New Year! Oh gosh my stretchy pants are a bit tight too! Happy New Year, Traci! Yup, I definitely like to think of zoodles (and other similar things) as “in addition to” pasta and not “instead of” pasta. Great way to bulk up dishes without a lot of calories. But I still like a little real pasta in there! 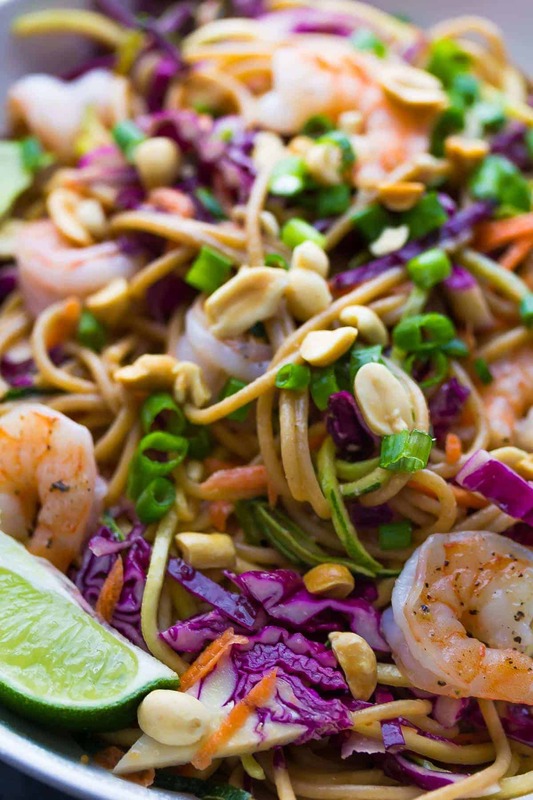 Love all the colors in this dish and gimme that peanut sauce! Happy New Year, Denise! I think that’s why I was hesitant to buy a spiralizer, I knew pasta ‘replacement’ was never gonna work for me. Thanks Liz, Happy New Year! I agree with you on both counts…zucchini noodles can last FOREVER and I don’t consider it a pasta replacement, either. I thought I would before I tried it, but although it’s delicious, it’s not the same, and that’s ok! Because I could eat zoodles 24/7, especially if they have thai flavors like this. Such a pretty bowl, Denise! YES! Thanks so much Gayle!